I love pondering the competing, contradictory, complementary, and random elements found when the musical atom splits and all its elements are laid before you. To borrow from Jagger and Richards, "It's the singer, not the song." Or is it? That's where the role of the performer and performance come into play. Music, drama, and comedy were at one time by necessity live action activities. That changed with the ability to capture sound and video but "live" hasn't disappeared and continues to be part of the equation, particularly in music. How important is "performer" in the anatomy of an artist? It's a fun discussion and I've traveled many miles considering different angles on the way home from different concerts throughout my life. There are so many schools of thought and so many different kinds of performers that, when paired with different kinds of music, can create a vast array of experiences. You've got your carnival barkers, your televangelist or tent revival preacher, class clown, exhibitionist, beat poet, anti-performer and countless combinations and variations of all of the above. Magic happens when performance, performer, and song intersect at just the right place. I started thinking about it again while listening to Junior Wells' Live in Boston 1966, just released this fall by Chicago's Delmark label. This is as close to experiencing Junior Wells in concert as I'm ever going to get and that's a tragedy because this and Live at Theresa's 1975 give us small glimpses of the magic he could conjour on any given night. Junior Wells is more than a badass with a harmonica. He was most certainly that (hit yourself if you don't own Hoodoo Man Blues and then correct that) and these performances are good, the audio quality is solid, and Wells is backed ably by one of Chicago's most prolific rhythm sections (the Meyers boys, Dave and Louis, and Fred Below) who have so many credits on guitar, bass, and drums you have to wonder if Chess Records didn't have a Dred Pirate Roberts thing going. 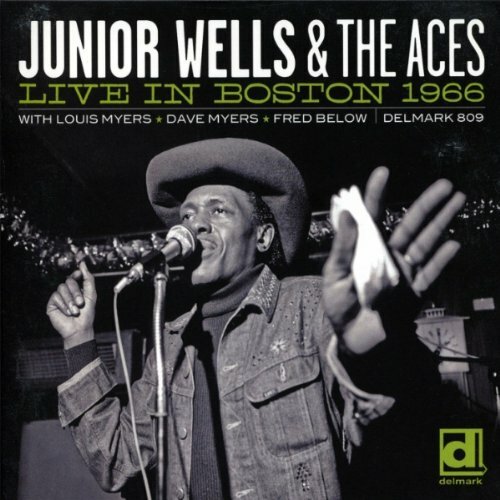 All of that is great but what makes this set a treasure is that Junior Wells was a first-rate entertainer in addition to being a badass harp player and you get a taste of that on Live Boston 1966. The good folks at Delmark left a considerable amount of his between-song banter untouched so you get to hear Wells weave his harp through the sound of his band and then listen to the man weave his way between songs, interacting with the audience, telling stories, and cutting up. It’s seamless and natural. The songs feel alive and fresh with a hot mix of improvisation and precision. There are moments when it feels like it could collapse but never does- at least not on this September night in Boston. If it ever did go entirely off the rails, Wells would have used that charisma to make it work to his advantage. He may not have reinvented blues harp but Junior Wells was an original and the world is a better place because of it. I’ll never get to experience it in person but thanks to Delmark I get a taste of what I missed.